In the flow, all that exists is love. I remember when the dream was unfolding how I worried about using violence to kill off this part of me that was killing me. “Can you not just love her Louise?” my subconscious wondered aloud to my dream-self. And the answer was — claim my right to live. In the physical world, like Val, I believe using violence is not the road to peace. It is the path to more violence. In the metaphysical world of my psyche, my dream was not about violence and using it to get what I want. Looking at it through the lens of choosing between life and death, the violence falls away to reveal truth shimmering in its absence. Life is precious. Life is magnificent. And in the unique expression of my life, I must choose to love my being with all of me, letting go of those parts that fear being all of me. Standing in the dissonance between life and death, I must choose to live everyday without fearing death. I must choose to be conscious of this beautiful, miraculous gift of life I have been given and honour it, cherish it and treat it with Love in all ways, through all things, with all my being. In Colin Tipping’s, Radical Forgiveness, he suggests holding a wake for the ‘inner child’ (not the playful, creative inspiring inner child, but the whining little brat who lives in the backroom of our minds). He writes that our spiritual evolution depends heavily upon our recovery from our worst addiction — our addiction to the victim archetype, which traps us in the past and saps our life energy. I see the killing of that part of me that was killing me as an essential act to let go of my victim archetype and further my spiritual evolution. 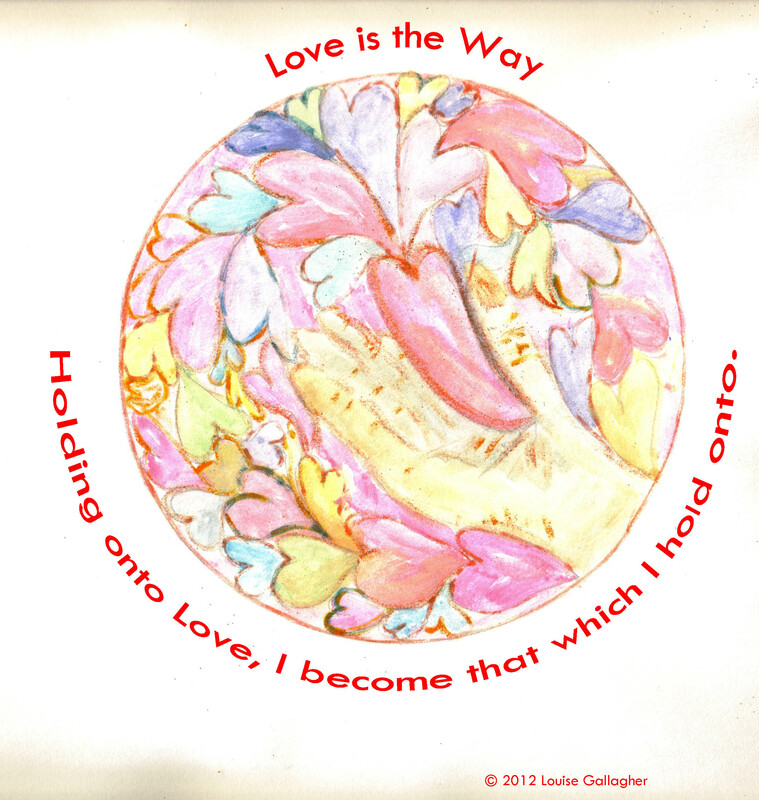 I see it as an act of love freeing me to be the conduit through which Love flows in its eternal journey of life. In my being with the flow, I become the flow. In the flow, all that exists is Love. Categories: Essential Journey | Tags: choosing life, Colin Tipping, Radical Forgiveness, spiritual evolution, wake for the inner child | Permalink. Your words are so healing. A close friend just lost her son, 34, to alcohol and drugs. I wish he’d have read your words. Thank you Lisa. I am sorry to hear of your friend’s loss. Love and light to you and your friend. Hugs. and most of us should be very happy if we ever get that far …. And yes sir. I will not eat after 9pm. Though… the dreams are rather exciting! Amen amen amen! What a vivid and beautiful understanding of your spiritual journey, Louise. Hugs and love to you. I love the conversation you’re having over here. Really stirs my heart. Thanks for this goodness and that quote about addiction to victim archetype. I feel it deeply within me Jennifer and in surrendering it, it letting it go, I continue to deepen my understanding of my free will, my potency, my capacity to create and be, free. Many hugs and much love my friend.